Hello and welcome back to another episode of the Art of Business English. I hope you’re all having a great week. Are you a small business owner? Do you have to give short company presentations? 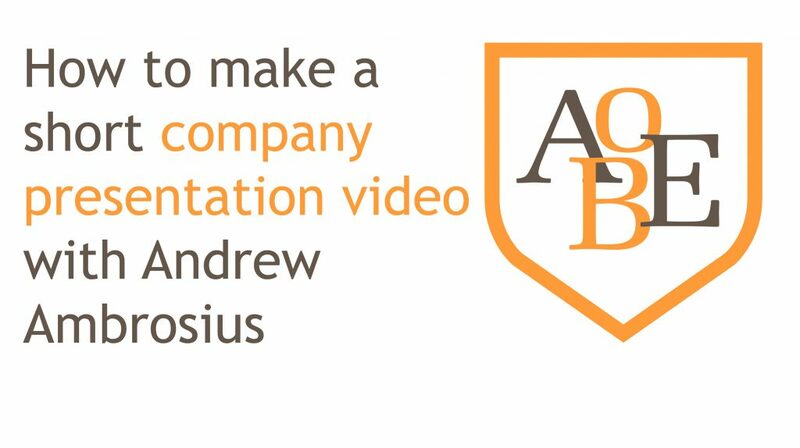 Have you ever thought about how you could make a short company presentation more attractive without spending a fortune on a professional? If this sounds like you or even if you would like to learn how you could make your presentations a bit more interesting, then today’s episode will be super helpful. I was faced with the same dilemma, I was thinking to myself. How can I make a presentation more engaging? Instead of just sending a PDF attached to an email, I thought, what if I record myself giving the presentation on my PC, then send that video direct to my potential client. If this sounds like something you would like to do then today you are in for a real treat as I show you a behind the scenes look at how you can develop your own in house presentations without spending a fortune. All it takes is a little know how and creativity and you’re on your way. If you need help with your presentation vocabulary and expressions, then please take a look at episodes 39, 40 and 41. There we cover all of the language that you need and the steps you should take to create a captivating presentation. Let’s get started with what you need. The concept here is that we are going to be creating a PowerPoint or Pages presentation on our PC, we will then use screen recording software to capture all the movement on our screen and finally we will need a microphone to capture the sounds. So, firstly you will need a PC or Mac with a copy of PowerPoint or Pages. You could also use Presi if you want to create your presentation in Presi, however this will require you to understand how Presi works, which is outside of the scope of this lesson. Secondly, you should really have a dual monitor setup to take advantage of the presenter view in PowerPoint. This allows you to see what you have written as notes while only recording the second screen. Here you can see a screenshot of my setup. Here on the left I have Presenter view, audacity and Word with the transcript I have created for the episode. On the right, I have the PowerPoint presentation with the screen recording. Next, you will require some sort of screen capturing software. There are some free options, however I personally use Camtasia on the PC. Camtasia is not a free option, however, if you are looking for a free option there are ones such as Flashback recorder and Open Broadcaster Recorder. If you are willing to invest some money then there is Snagit, and Screenflow, which are both good options. Remember, you should get a screen recording program that offers some basic video editing. We will need to cut out some frames if we make a mistake, this will save us from repeating the recording over and over again. The next thing you will need is a good microphone, you can use one from a headset or the one that comes with your PC or webcam, however, a good mic makes a huge difference for audio quality. You can get some really cheap and good quality mics from Amazon. Blue Yeti is the standard for podcasting and costs about 120 to 180 euros, depending on where you look. You could also use what I use, a Samson C01U Pro, which you can pick up for about 80 euros. Not a huge investment but the difference in sound quality is very noticeable. Finally, there are two optional things you could grab. Firstly, you can record your audio separately using Audacity. The advantage to this is that you are able to then edit the audio as a separate file and tweak it so that it sounds better. The only issue with Audacity is that it requires a bit of a learning curve. On the positive side, it’s free and its popularity means that there are a lot of instructional videos on YouTube to learn how to do different things. Secondly, you can invest in a presentation pointer. Basically a USB pointer device that allows you to move your slides back and forward. The advantage of ones of these is that you can flick through your slides without making much noise. If you are presenting in person then they are a great option as they can be held in your hand subtly and help you to really interact with your audience without having to be near your keyboard. So, now that we have all the pieces in place, let’s take a look at how we can prepare our presentation so that we can record it.